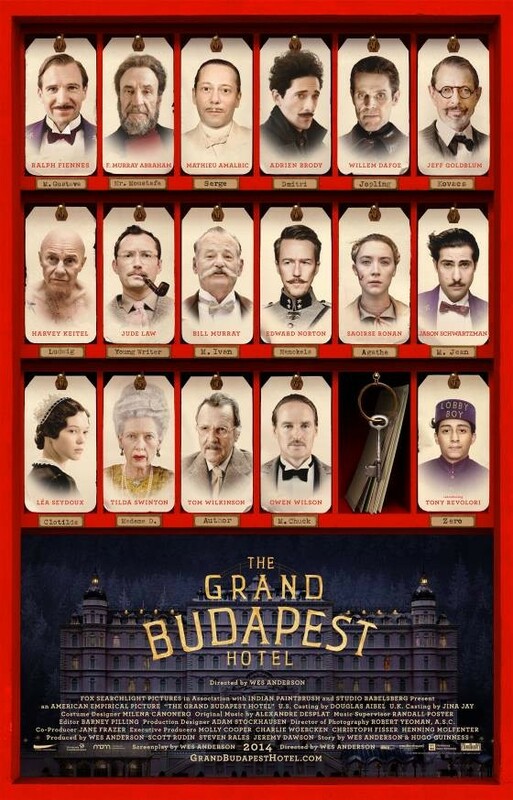 Probably the most anticipated film of this year’s SXSW, The Grand Budapest Hotel marks writer-director Wes Anderson’s 8th feature film after his Oscar nomination a year ago for 2012’s Moonrise Kingdom, one of those years best films. The Grand Budapest Hotel opened officially in the United States last Friday, but us common folk here in Austin don’t have those luxuries in New York and LA to see it first, so this is our big premiere. In fact, the premiere was so big that Richard Linklater was in the audience just to introduce Wes Anderson before and after the movie. That got a lot of us excited, even if a lot of people had crappy seats like me due to the insane amount of people trying to get in last night (I got in line 2 and a half hours ahead and I was number 447 in line). So while the seats weren’t great, my back still kind of hurts the way I was positioned, it was bearable, and I can now give you my report of The Grand Budapest Hotel. Let’s begin. The film spans over several years, as it opens with Tom Wilkinson playing a famous writer who wrote a book about this story. It then cuts back to the 60’s, with that same writer, played by Jude Law, who stays at the hotel and interviews a man named Zero, played in adult form by the legendary F. Murray Abraham. Zero tells his story of how he was a lobby boy at The Grand Budapest Hotel several years ago, and he was also the personal assistant to M. Gustave H., played by Ralph Fiennes. Gustave was a charismatic man but a womanizer of older women who stayed at the hotel (a less exaggerated version of Max Bialystock from Mel Brooks’ The Producers, minus the money aspect). One of his suitors is an older woman played by Tilda Swinton, who ends up dead, and many believe that Gustave is responsible for her death. The film then becomes part crime caper, part escape tale, and everything in between. The film marks the first time that Anderson has written the script by himself, without any help from his usual writer partners of Noah Bambach, Owen Wilson (who makes an appearance in the film as always) or Roman Coppola. You would think that it would be a warning sign that Anderson does not have anyone to back him up, but Anderson has been doing this for years, and it works to brilliant effects. Granted, nothing really changes in the formula, as the film still has that beautiful but simplistic look of all of Anderson’s films, with the deadpan delivery from all his actors, and some may be annoyed by that, but I personally think it’s genius the way Anderson makes his pictures. I think that The Royal Tennenbaums, which that and Rushmore are my favorites, is probably the funniest film made in the past 15 years. While The Grand Budapest Hotel doesn’t come close to those films, it’s by far the best film of 2014 and even better than his already great last film, Moonrise Kingdom. The acting in the film is phenomenal, with Ralph Fiennes giving not only the best performance of the film, but the best of his career in quite some time. His comedic timing is wonderful, and his chemistry with the younger Zero in the film, played by newcomer Tony Revolori is spot on. The dry-witted humor of Fiennes is also quite terrific, along with the rest of this massive cast. Wes Anderson regulars like Adrien Brody, Jeff Goldblum, Bob Balaban, Willem Dafoe, Jason Swartzman, Harvey Keitel, and even Bill Murray all make appearances. The cast is massive for a film that cost only 3 million dollars. And what’s even better is that each actor is at the top of their game, and they all join in willingly on the fun being had in this wacky and brilliant little movie. What is also worth noting is that the film is shot in three different aspect ratios, which for the common folk would mean that in some scenes the film is in widescreen, but most of the film has the black bars on the side, mainly to be significant to the period of time. And like all of Anderson’s previous films, they are all shot beautifully and edited flawlessly. And while the film is a mainly tiny film with its budget, Anderson is able to use his cookie cutter special effects that he’s known for to great effects, and in some ways this film is a pretty big epic, of course to a fault. The sets are marvelous and grand, and the environment around them, 1930’s Europe, feels very authentic but very Wes Anderson like. And to be honest with you, I have no complaints with The Grand Budapest Hotel. I never really have any complaints with any of Anderson’s pictures (hell, I thought The Life Aquatic was brilliant) and so this one is no different. The film should be coming out near you in the next coming weeks, and when it does I highly recommend you to go see the film. It’s one of the most clever films to come out in recent memory and one that will be remembered for quite some time. Unlike the last few days, I’m only going to see one film today, which is The Raid 2 later this evening. This is my second attempt at seeing the film (read about my first attempt here), so here’s to this going well. I also saw Frank yesterday, so look for that review in the next few hours. Thanks a bunch and I’ll see you soon. March 11, 2014 in 2014 Film Reviews, 2014 SXSW Reviews, Film Fest Coverage, Movie Reviews.